Recently, I’ve been examining Brené Brown’s research about vulnerability and it’s really got me thinking about what it means to college and university professors, as well as how it may be acting as a barrier to innovation. 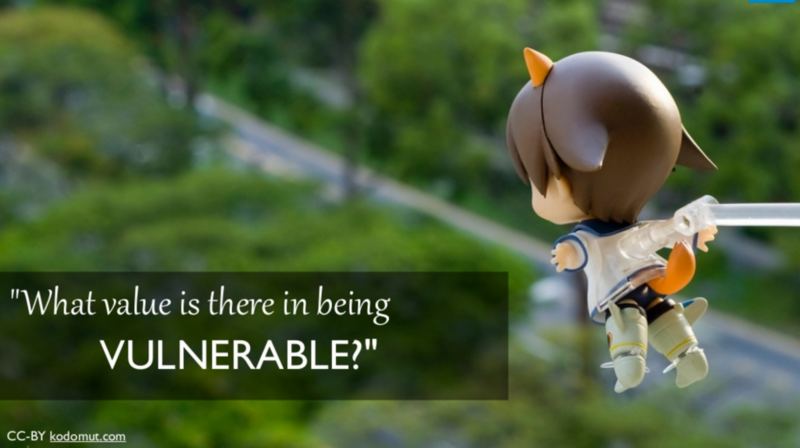 I suspect that vulnerability may seem like a strange topic to many of you. However, my experiences, which I share below, suggest that professors want to talk about it. Dr. Brown has conducted hundreds of interviews and analyzed this rich data to understand what makes people vulnerable. In a nutshell, Brown defines vulnerability as “uncertainty, risk, and emotional exposure.” It is also shown to be the “core, the heart, the center of meaningful human experience.” Beyond personal fulfillment, however, vulnerability is the pathway to discovery. It is where innovation and creativity emerge. Closing ourselves off to vulnerable situations prevents us from trying new things and contributing to change. A couple of weeks ago, I developed a survey about vulnerability and professors with the intention of using the data as a pilot study for a formalized research study in the future. The survey invited college and university professors anywhere in the world to participate. I chose to Tweet the link to my 4,000+ followers, as it was a simple way to connect with other professors. After four days, I had received 17 responses. I was thrilled! I proceeded to analyze that data. Then, several days later, I looked at the response form again. I was stunned to see that the response number had grown from 17 to 68. To me, this strong response indicates that professors want share their experiences and perceptions of vulnerability. Who are these professors and what are their experiences? The graphic below illustrates the demographics of the pilot study sample (n=17). The majority (76%) of the participants who responded were female, from a 4-year institution (76%), and earned a doctorate degree (70%). Thirteen participants were from the United States, three participated from Canada, and one from Egypt. Participant demographics, pilot study about Professors and Vulnerability. Let’s take a look at the findings from this pilot study. 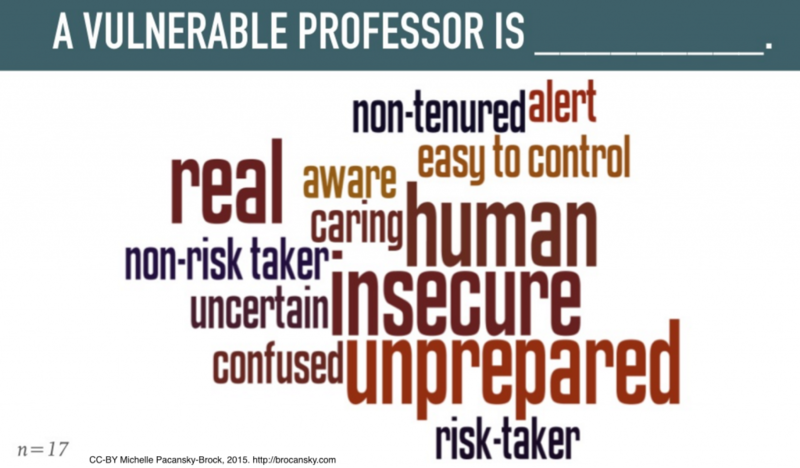 In the survey, I asked participants to complete the sentence, “A vulnerable professor is ________.” Most participants chose a word that had either a positive or negative connotation. The most frequent responses were “real” (2), “human” (2), “insecure” (2) and “unprepared” (2) (see word cloud below for all responses). Why the paradox? As Brown says, “It’s the first thing I look for in you and the last thing I want you to see in me.” Vulnerability is a characteristic humans seek in others. A vulnerable person is perceived as brave, but that same person feels weak. Given the vulnerability paradox, the contrast in the descriptive terms that surfaced in the data is not surprising. But the themes “insecure” and “unprepared” need unpacking. These terms may suggest that some professors are likely to avoid situations that have potential to reveal the cracks in their armor of expertise. The data also showed themes in vulnerability triggers among the professors who participated. Each theme, its most prevalent sub-themes, and the number of participants who referenced each the theme are listed below. For quotes supporting each theme, please refer to slides 22-32 in this presentation. The action most frequently noted by participants as one they avoid due to vulnerability is “trying new teaching methods” (5). Specifically, participants cited class discussions, flipping the classroom, public blogging, and employing new grading strategies. In an age where our students have access to a world of knowledge from any place at any time, our students need professors to try new teaching methods more than ever. Living in an age of knowledge abundance requires new skills that are not cultivated through sitting passively in a lecture. Learning in colleges and universities needs to be guiding students to become skilled at mindfully navigating the flood of information in their lives. This includes actively constructing one’s own digital identity, connecting with and learning from a global community, evaluating the credibility of information (what Rheingold refers to as “crap detection”), understanding how to locate digital content permitted for re-use and how to appropriately re-use that content. I often think about how it feels as if we are teaching in a gap today — faculty themselves need to cultivate these new skills before they can feel confident to foster them in their students. And this requires professors to see themselves as learners, as opposed to vessels of knowledge. For many professors, making this shift is a very vulnerable experience. In order to prepare students for their their futures, we can’t cling to the way we’ve always done things. If vulnerability is preventing faculty from trying new teaching approaches, vulnerability must be seen as important and necessary. I believe this process must start at the organizational level by framing vulnerability as a quality of a professor committed to improving the student experience. This calls for leaders of higher education institutions to foster a culture of risk-taking, which is something I believe President Rush and other leaders at CSU Channel Islands have done exceptionally well. The culture here at CI is rare and precious. By sharing the teaching and learning innovations you practice in your physical, blended, and/or online learning environments, you contribute to making this change. Sharing allows others to begin to see a vulnerable professor as a courageous professor who takes risks to do what’s best for students. I have one final thought about vulnerability and professors. Perhaps, our own memories hold keys to guide us in changing how professors relate to vulnerability. Take a few moments to reflect on your college learning experiences. Which professors are most memorable to you today? Describe them in a word or two. I’d love to see what words you choose so please Tweet them with the hashtag #VulnerableProf or leave a comment on this post below. Brown, Brené. (2010). The Power of Vulnerability, TED Talk. Brown, Brené. (2012). Daring Greatly: How the courage to be vulnerable transforms the way we live, love, parent, and lead. New York, NY: Gotham Books.